What do you do with your old spectacles? 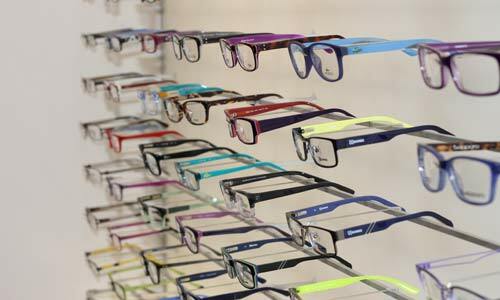 Do you have one or more sets of glasses with an old or out of date prescription that you no longer use? If so, have you considered donating them? Donating your old glasses rather than simply throwing them out means that they can be passed on to someone less fortunate. The prescription of your old lenses is read using a vertometer and the glasses are given to someone whose prescription is similar to that of your old glasses. Donating old glasses provides people with the gift of sight. At Custom EyeCare, we accept glasses donations on behalf of the Lions Club, which are then passed on to people who need them. If you have any old glasses to donate, be sure to drop them into the practice so we can pass them on to The Lions Club. Thankyou from The Lions Club! The below video from the Lions Club shows where your donated glasses go, and says thank-you for all the donations received so far! While it might be tempting to add impact or wow factor to your Halloween costume with novelty or decorative contact lenses, there are many dangers to be aware of which could lead to a scarier end to Halloween than expected. Contact lenses are not ‘one size fits all’ and if people want to enhance their Halloween look with fancy dress lenses, it is important to make sure the lenses are prescribed by an optometrist who will measure each eye to properly fit the lenses and evaluate how the eye responds to contact lens wear. Those who have not been professionally fitted often do not have sufficient knowledge regarding handling and aftercare, which is essential to maintaining a healthy eye. 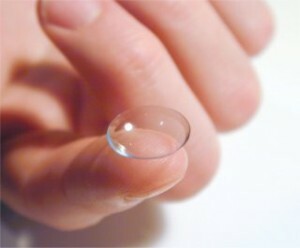 Inappropriate or incorrect contact lens wear as a result of lenses that are not properly fitted (or not fitted at all!) can cause damage to your cornea and eyelids, including infection, inflammation, trauma and the growth of new blood vessels. Please don’t take a chance on your vision this Halloween. If you are interested in wearing coloured contact lenses please organise a contact lens fitting appointment with one of our optometrists who can provide you with professional guidance and care. This month I once again made the journey from Newcastle to the NT to do eye testing in remote Aboriginal communities. This is the third year I’ve done one of these amazing trips, and every time I go there’s so much to learn, but at the same time I realise there’ s so much more work to be done. Each trip goes to a different destination and this year for me it was an area called Utopia, about 3 to 4 hours drive north east of Alice Springs. Utopia has been called the “poorest place in Australia”. The first hour of the drive is on bitumen and the rest dirt, following the Sandover Highway. The Sandover is effectively a service road for the many Aboriginal communities in this huge area, and we didn’t see a single tourist car or camper all week in spite of the many hours spent on the road. The larger communities in the outback NT have perhaps several hundred residents and do have their own health clinics, usually staffed by Remote Area Health Corp (RAHC) nurses and sometimes a GP. On most trips we set up and operate out of a spare room in a clinic for a day or two before moving on to the next location. On this trip though, we trialled a new system of travelling out to the smaller “outstations” in the Utopia region, where perhaps only a few dozen people live. This turned out to be a successful idea, because we saw people who might not have come in to see us at the main health clinic. Being portable, the eye testing setup uses mostly traditional equipment rather than the modern high tech instruments available to us in the city – but we can still do the necessary tests and measure what glasses (if any) people need, as well as check the health of the eyes. 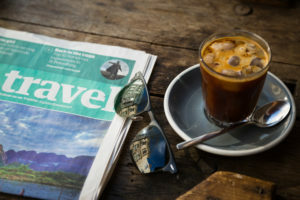 English is a second language and is not widely spoken for most locals in the remote communities of the NT, so public health campaigns that might work in cities & towns can be lost on some of the residents of Utopia and places like it. Because of this and also the remoteness, poverty, and often low quality ‘Western’ foods brought in from outside the area, there are many people with reduced vision due to diabetes, cataracts, or simply just the lack of a pair of glasses. The program I work under (Brien Holden Vision Institute) provides basic magnifying glasses at very low cost, and people who need surgery or other medical eye treatment can be referred to an eye surgeon either in Alice Springs, or locally at the next six-monthly ophthalmology visit to the community. So even though the travel hours are long and the conditions can be difficult, the program really does make a difference to people who for various reasons would ‘fall through the cracks’ and miss out on eye care without this visiting program. One of the many things that’s been reinforced to me from working in the NT communities is that clear vision is much more than just a convenience – it’s absolutely crucial for participating in family life and performing your role in society. This is just as true whether you live in a remote NT community or a big city. You’re ready to see the world, but without the appropriate eyewear whilst travelling, you might not be seeing much of anything. For most people, eyewear is more than an accessory, it’s a necessity. 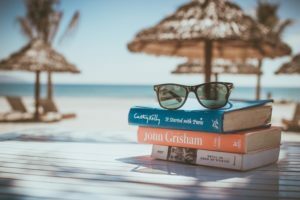 When planning a holiday, many people consider appropriate clothing and shoes well in advance, and don’t think about their eyewear until it’s too late! 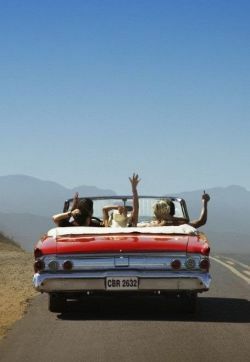 Whether you’re planning a relaxing resort holiday, braving a cold overseas winter, or venturing out on a road-trip, it’s important to have appropriate eyewear if you want to get the most out of your next holiday. A backup or emergency set of spectacles can be a lifesaver if anything were to happen to your current pair. 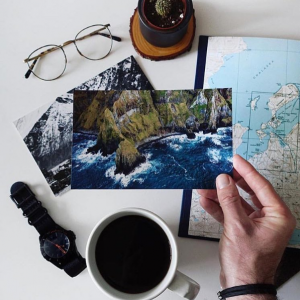 It is important to organise new eyewear for your holiday well in advance, as it can take up to 2 weeks for your new lenses to be made and fitted into your new frame. When you are on holidays, clear vision is important as it allows you to see and do all the things you have travelled to see and do! 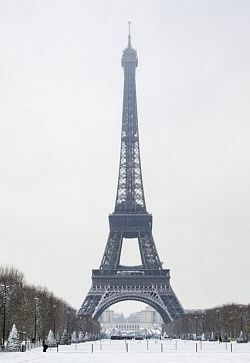 Follow these handy tips to ensure you have clear vision on your next holiday! A spare pair can be a true lifesaver if anything happens to your main pair of spectacles whilst travelling. A spare pair could be your old spectacles, or a new second pair made with your most recent prescription. If your next holiday involves air travel, it is a great idea to separate your spectacles. Keep your spare pair in your checked baggage and your current pair in your carry on. Prescription Sunglasses Are More Useful Than You Think! 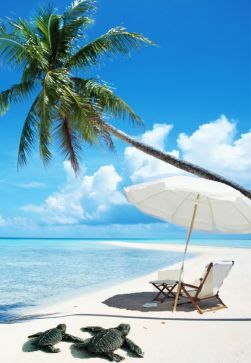 There is a good chance your next holiday will either be somewhere sunny, near the water, a mountainous area or the snow. All of these environments require a quality pair of sunglasses. Sunglasses protect your eyes against harmful UV light which can increase the progression of cataracts, macular degeneration, and other eye problems. A repair kit can come in handy if you need to quickly tighten a loose screw whilst travelling. If They’re Not On Your Face, They’re In The Case! If you aren’t wearing your spectacles, ensure they are put away in their case. Keeping your Spectacles in the case when they aren’t on your face will help prevent accidental damage. Keeping the case in your suitcase can also help prevent accidentally leaving your spectacles in your hotel room. Follow these handy tips to ensure you can see clearly on your next holiday! Don’t Exclusively Rely on Your Contact Lenses – Take Your Spectacles! Whilst contact lenses offer your eyes freedom your spectacles don’t, it’s important not to exclusively rely on them when travelling. If you experience any redness in your eyes, or any signs of an eye infection, it is important to give your eyes a break from contact lens wear. If you don’t have any spectacles with you on your travels, you won’t be able to give your eyes a rest without compromising your vision. Cabin air can dry out your eyes, making contact lens wear uncomfortable. Whilst lubricating eye drops may be helpful, it is always most comfortable to forgo wearing your contact lenses, especially on long haul flights. If you decide to wear your contact lenses on a flight, ensure you have spectacles in your carry-on luggage so you can swap if your eyes become too uncomfortable. It is important to stock up on contact lens solution for your next holiday. This means you will be prepared if the solution you use is not readily available in the area you are travelling. Taking more solution than you think you may need is also a good idea, just in case you run out. It is also important to remember never to use water with your contact lenses. Daily contact lenses can be easily disposed of at the end of each day, which means you don’t have to worry about cleaning and storing your lenses at the end of each day. Daily contact lenses also don’t require you to carry bulky bottles of contact lens solution, which leaves you with extra room in your suitcase! Always take a few extra pairs of contact lenses with you when travelling as backups. You don’t want to be caught out at the end of your trip with less contact lenses than you thought you would need! If you wear contact lenses it’s a great idea to keep a few pairs in your carry-on luggage. That way, if anything happens to either your checked or carry-on luggage, you will always have a pair of spectacles, or contact lenses. Have you ever heard someone complain about multifocal glasses? They seem to have an undeserved bad reputation – but the fact is that multifocals, or progressive lenses, are the most versatile lenses available. 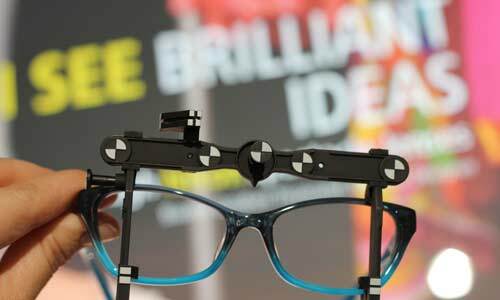 Keep reading to find out the myths & the truth about multifocals. Myth 1: Sometimes people fear that wearing multifocals means wearing glasses all the time – but that’s not true. 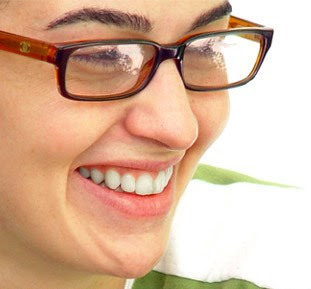 Even people who only need glasses for close up – reading, ipad, phone and computer – can wear multifocals for these activities, and then take them off when finished. Why not just wear single-focus reading lenses? Because with multifocals, unlike with simple reading glasses, you can easily glance up across the room to look at the TV, a clock on the wall, or someone’s face, without having to remove or look over the glasses. As wearers of reading glasses will tell you, having to continually remove or look over reading glasses to see around the room can become a bit of a nuisance – but this is not a problem with multifocals. Myth 2: Another myth about multifocals is that you have to start moving your head up & down or into strange positions to see, or that the clear zone for reading is like looking through a key hole. This only happens if multifocals are measured or manufactured incorrectly, or fitted into a frame that’s too small – we do still see people having these problems with glasses purchased elsewhere or fitted by unqualified staff. When correctly measured and fitted, modern multifocals allow for a natural, comfortable, normal head posture when reading or using a computer, with no crazy head movements needed! Myth 3: The last myth about multifocals is that they’re “hard to get used to”. Sure, there’s a settling in period where they feel a little unusual, just like a new pair of shoes or driving a new car. But once again, multifocals are only “hard to get used to” if they’ve been measured or fitted incorrectly, or if an older, cheaper lens design is used. Modern multifocals, correctly fitted, are very easy to use – which is why they’re the preferred personal choice of almost all optometrists aged over 45! 🙂 To find out if they’re the right option for you, contact us to book an appointment for an eye & vision consultation, customised to your needs. Or, click a link below to read more information. 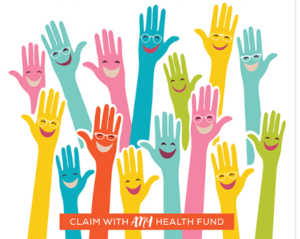 Are your optical benefits expiring on June 30? If your optical benefits are expiring on June 30, 2016, now is the time to ensure you make the most of them! Claim a new look with your unused benefits by selecting from new season optical frames, prescription sunglasses or contact lenses. Or, why not choose a convenient second pair of spectacles to suit your needs? Visit us at our new practice, 158 Darby Street, Newcastle, and make the most of your entitlements today! Why do I have problems driving at night? Do you dislike or avoid driving at night because the other cars’ headlights seem so bright & annoying? Do you sometimes have trouble seeing the edge of the road or lane lines? One of the main causes of these problems is the increasing haziness of the natural lens inside our own eye. When we are born, our internal lens is nice & clear, but as we go through life our lens gradually becomes hazier – it happens to everyone, but it’s worse if you’ve had a lot of sun exposure without wearing sunglasses. The result of this natural process is that the headlights of oncoming cars seem brighter and glarier, making it harder to drive at night. For most people, this really starts to become noticeable past the age of 60 or so. If you a hazy lens, it’ll be visible to your optometrist during your eye examination using a microscope, and it’s even possible to photograph the haze and show it to you on a computer screen. The easiest tip is to keep your car windscreen absolutely clean, inside & out. Any smudges, smears, or oily films left on your windscreen will cause lights to scatter, making glare worse. Make sure your headlights are clean and pointed in the right direction – a minor bump could have caused a misalignment that you’re not even aware of. Ask your mechanic to check them. 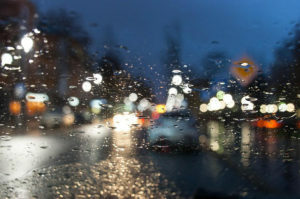 Even though your vision for daytime driving might be excellent, a pair of prescription night driving glasses with anti-reflective coating can really help some people in reducing the ‘spread out’ appearance of lights at night time. A proper eye & vision examination is the way to find out if this will help you. Eventually, if a hazy lens becomes really cloudy or foggy then you end up with a cataract. Modern cataract surgery is relatively fast and safe, and often results in a huge improvement in night time vision. We assess every patient for cataracts, and if found we can refer you to a local ophthalmologist for possible cataract surgery. Lauren is a Newcastle ‘local’ who you might remember from a few years back when she worked with us over at Marketown during her gap year, before heading off to university. Fast forward to 2016: Lauren is now just a couple of months away from graduating as a fully qualified optometrist, and she’s doing her final clinical training placement with us here at Custom EyeCare on Darby Street. Lauren has been seeing patients of all ages, prescribing glasses, diagnosing eye conditions, and giving good advice. We’ve already received great feedback from patients about her work! Since Lauren hasn’t officially graduated yet, her consultations are routinely supervised & checked by senior optometrists using our networked computer & imaging technology, and also in person. So if your next eye appointment is coming around soon, we invite you to see Lauren for a thorough and friendly eye examination performed to the same high standards you enjoy from all the optometrists at Custom EyeCare. We’re all going down to Sydney for a professional development day in the city this Wednesday the 10th of February, so the practice will be closed for the day. If you need to place an order, make an appointment, or collect glasses or contact lenses, please make sure you do it either before or after Wednesday. Don’t forget you can always contact us via the “contact” page of our website – we’ll receive the message later and then reply to you. We’re back on deck again at 9.00am Thursday morning! A lot of Newcastle parents seem to be relieved right now – because their kids are back to school and we adults can resume our “normal lives”! New teachers, new classmates, and maybe new schools can all be challenges, for some kids more than others. But for some families, just doing routine nightly homework can also be a big challenge. What many parents don’t realise is that vision and focussing problems can affect children in unexpected ways. For example, most kids who wear glasses don’t wear them in order to see better or more clearly. Instead, children’s glasses often allow the child to focus close up more easily, with less effort and more ‘stamina’, when reading for longer than a few minutes. This then translates into better concentration, better comprehension, and more enjoyment of reading, literacy and schoolwork generally – even though the child was never aware of any blurry vision in the first place. So asking a kid if he or she can see the blackboard is often not a helpful question at all, especially if it’s literacy and concentration where the struggle is happening. For more information, read about behavioural optometry here. 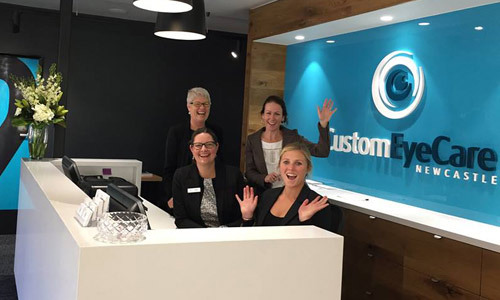 On Tuesday November 3 2015, Custom EyeCare closed early for our annual staff Melbourne Cup function. Despite the rainy start, we all dressed up in our races gear and braved the wild weather on the walk down Darby Street to neighbouring cafe Deco. Whilst none of us won “Best dressed” on the day, we all looked fabulous, and Michelle won “Best Fascinator” for her gorgeous oversized headpiece from Melbourne. Despite no one backing a winner on the day, we all had a wonderful, fun afternoon together. We hope everyone else had an enjoyable afternoon! Dom, Heidi and Jackie spent a sunny Sunday in September at an old stomping ground – the University of NSW. Only this time Dom and Heidi were the teachers instead of the students. 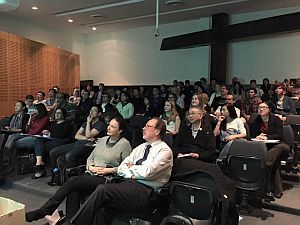 The day was jam packed with lectures, live contact lens fittings and interactive workshops with the aim of educating optometrists on the art of fitting specialty contact lenses for eye diseases, such as keratoconus. 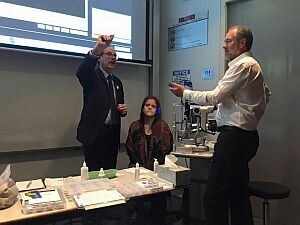 Among the presenters were some optometry legends: Paul Rose (the brains behind Rose K lenses for keratoconus), Alan Saks (Kiwi guru and author) and Emmanuel Calligeros (taught Heidi about contact lenses at University). Custom Eyecare (formerly Marketown Optical) has now moved from Marketown to the nearby location of 158 Darby Street, Cooks Hill. We’re now settling in to our new home on Darby Street, Newcastle’s famous cafe strip. We are at number 158 – next to Darby Street Quality Meats, and a few doors down from the Hotel Delany, on the same side. We have our own free parking spaces right out the front, and also there is the 2hr free council car park behind Mons Thai and the Hotel Delany. Now you can enjoy a coffee or a nice lunch before or after your experience at Custom EyeCare! Its not everyday that we get to dress down at work but today we made an exception for a great cause. Our team had great fun supporting Jeans for Genes Day. Dust, building works, contact lenses and education! May was a busy month for our team as we were in the midst of building our new practice in Darby Street. Even with the chaos, our Optometrists managed to find the time to educate themselves and educate others. At Custom Eyecare we pride ourselves on keeping up to date with advances in technology and the latest information available to our profession. 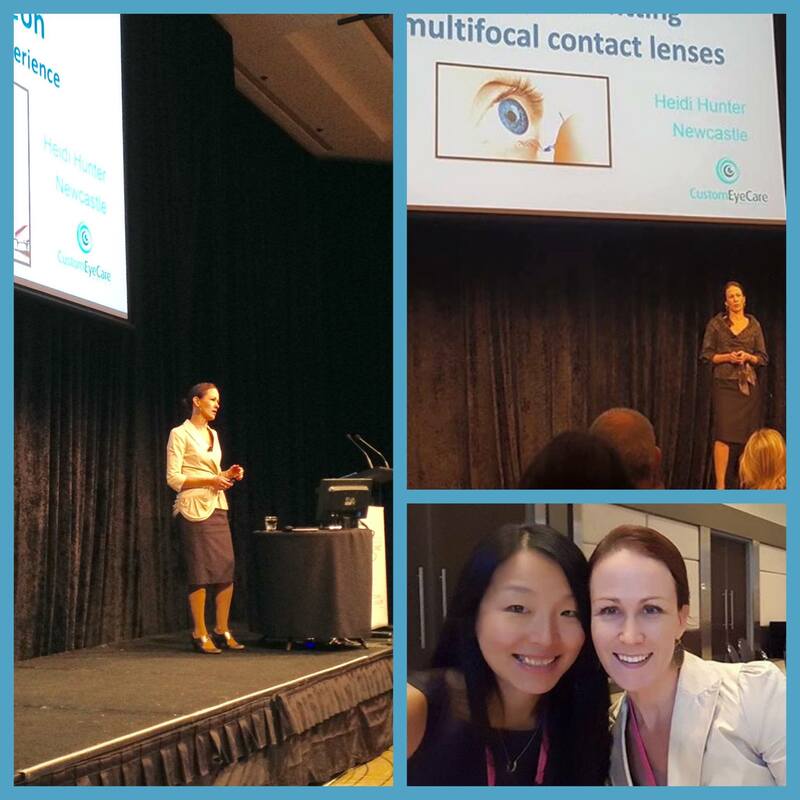 On the same weekend, Jackie headed south to Sydney for the Optometry Australia Super Sunday conference, while Dom and Heidi headed to the sunshine state to attend the Cornea and Contact Lens Society of Australia (CCLSA) Congress in the Gold Coast. Here Heidi had the honour of presenting to esteemed colleagues. Heidi was invited to give two presentations. The first topic was on the Art of Fitting Multifocal Contact Lenses and how to improve your fitting success by using the latest technology. The following day she gave a recount of her personal experience working with a local Corneal Eye Surgeon (Ophthalmologist). She presented several case studies which illustrated that co-managing patients requiring specialty contact lenses is in the best interests of our patients. Working together is something we constantly strive for at Custom Eyecare. We work collaboratively with local GPs, Ophthalmologists and Allied Health practitioners on a daily basis. 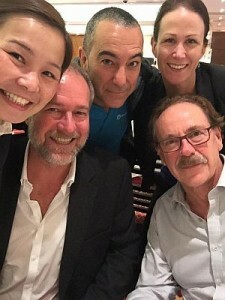 Super Sunday is the biggest Optometry Australia NSW conference that is run annually. It is a day jam packed with high quality education. Topics range from retinal disease diagnosis, the latest treatments for macula degeneration and dealing with ocular emergencies.